NASA engineers are looking for ways to reduce the wear and tear on the Mars rover Curiosity's wheels, which have accumulated an increasing number of dings and punctures over the last few months. Curiosity's handlers are driving the 1-ton rover more cautiously now and are checking the condition of its wheels frequently, NASA officials said. The rover team is also considering sending Curiosity over a 3-foot-tall (1 meter) sand dune soon to access a potentially smoother, less rocky route to its ultimate science destination, the foothills of the towering Mount Sharp. On Jan. 28, 2014, Curiosity Mars Rover used its Mast Camera to take the images combined in this scene. The sand dune in the upper center of the image spans a gap, called "Dingo Gap," between two short scarps. The dune is about 3 feet (1 meter) high. The nearer edge of it is about 115 feet (35 meters) away from the rover. "We'll take a peek over the dune into the valley immediately to the west to see whether the terrain looks as good as the analysis of orbital images implies," Erickson added, referring to pictures snapped by NASA's Mars Reconnaissance Orbiter. Engineers at JPL are also testing out techniques that may help mitigate Curiosity's wheel wear, including driving the rover backward and engaging only four of its six wheels at any one time. 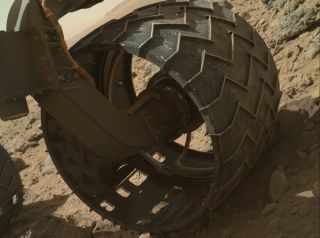 This latter strategy could prevent some punctures that occur when Curiosity's rear wheels push its middle and front wheels against sharp rocks, officials said. The Curiosity rover, which landed inside Mars' huge Gale Crater in August 2012, is in the middle of a long trek to the base of Mount Sharp, which rises about 3 miles (5 kilometers) into the Martian sky from Gale's center. Scientists want Curiosity to climb up the mountain's foothills, reading a history of the Red Planet's changing environmental conditions as it goes. This map shows the route that NASA's Curiosity Mars rover drove inside Gale Crater from its landing in August 2013 through Jan. 26, 2014. The rover is approaching a gap between two low scarps, "Dingo Gap." While Curiosity likely won't reach Mount Sharp until the middle of the year, engineers are already preparing to do science work there. For example, they've used a test rover on the ground to see how well Curiosity can drill into rock while perched on a slope. The early returns from these trials are promising, team members said. The rover team is currently examining photos taken by Curiosity to determine whether or not to cross the small sand dune. Mission scientists and engineers are also evaluating potential routes to a site called "KMS-9," where the rover may break out its trusty drill once again. "At KMS-9, we see three terrain types exposed and a relatively dust-free surface," said science team collaborator Katie Stack of Caltech in Pasadena. Curiosity has driven a total of 3.04 miles (4.89 kilometers) since arriving on Mars, officials said. The robot thus has a long way to go to catch its older, smaller cousin Opportunity, which has racked up 24 miles (38.7 km) to date since its January 2004 touchdown on the Red Planet.